You work hard on your marketing. From your directories to your on-site content and social media channels, there are a lot of places potential customers can find you. This is the idea, but even when you start gaining traction it can be tough to know where these new leads are coming from. There are a variety of ways to track traffic throughout your site, but those types of analytics don't generally work on third party sites. Call tracking numbers can be the perfect solution here, as it gives you a way to accurately measure your different marketing platforms. 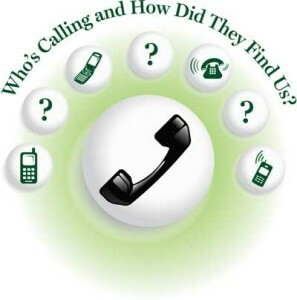 How do call tracking numbers work? There is generally a call tracking software behind it, which your developer can help you set up. The basic concept behind call tracking numbers is that they are forwarding numbers to your main one, which is to say that when someone calls these numbers it rings to your main line. The customer never knows the difference, but your tracking system logs how many calls came through from which tracking numbers. If you use one tracking number for Facebook, another on some of your top directories, and another in a radio ad for example, it now becomes very easy to gauge the success of these different platforms. In this example, the only place one of your numbers appears is on Facebook, so when people call it you can be certain that's where it came from. There's no guess work in the ROI of campaigns you may be running there, and call tracking numbers give you metrics on the actual conversion rate of ads you may have placed there. Facebook will show you how many visitors saw your ad, but it doesn't necessarily tell you what they did after that. In the same way that using website analytics helps you determine which pages are successful and how people interact with the site, call tracking numbers can help you narrow your marketing efforts and draw some useful conclusions. Even the most clever ads or carefully-selected sites to put your information on don't guarantee success. If an approach isn't working, it should become apparent pretty quickly. This helps you stop spending money where it isn't working and allocate it to where it has shown promise. Or, if you feel strongly about a certain site or ad medium, it can be an indicator that the ad needs adjustment. Maybe the wording is off, or maybe it needs to be shown in a different place and at a different time. For some ad campaigns there can be an adjustment period needed to dial it in for maximum impact, and leveraging call tracking numbers can be a measuring stick as you do so. Interested in learning more about call tracking numbers for your marketing? Call us today at 336-245-4805 or contact us through the site! We look forward to making your campaign more efficient and effective.